Coming off wins over Westlake and Santa Margarita Catholic, the Palos Verdes girls lacrosse team moved up from No. 3 to No. 2 in this week’s US Lacrosse/MaxLaxLA coaches poll, bumping Chaminade down a spot. The Sea Kings (5-1) beat No. 5 Westlake 11-6 on Wednesday, then went on the road Friday and beat Santa Margarita 13-8. Their only loss this season was a 13-11 decision at Aliso Niguel on March 6. Palos Verdes received two first-place votes and was listed second on six ballots and third on seven others. Redondo Union, a unanimous No. 1 pick a week ago, received 11 of 15 first-place votes and remains No. 1 in the poll, despite losing at OC power Foothill last week. Chaminade, winner of the Gold Bracket at the Birmingham Lax Bash on Saturday, also received two first-place votes this week. The Eagles, now No. 3, play host to the Sea Hawks on Tuesday. 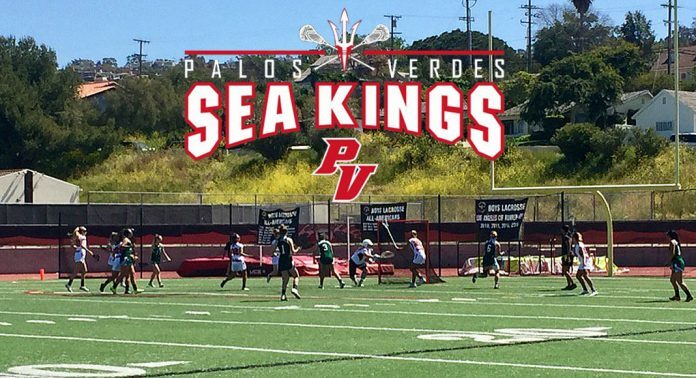 Palos Verdes faces Redondo for the first time on March 28. Birmingham, Downey and West Ranch also moved up in this week’s poll, with the Wildcats making the jump from No. 11 to No. 8 after posting wins over Westridge and Crescenta Valley. Cate School, which plays its first game of the season Thursday at Dos Pueblos, dropped out of the Top 10. The Rams were a semifinalist in the US Lacrosse North playoff tournament last spring but haven’t played yet in 2018. Mira Costa (3-2) and El Segundo (3-2) enter the poll at Nos. 19 and 20, respectively, with Peninsula and La Reina dropping out to make room. Below are the results of the US Lacrosse/MaxLaxLA girls LA coaches poll after Week 2 of the regular season, with 15 ballots submitted. Also receiving Top 20 votes: Peninsula (0-5); Simi Valley (6-3); Valencia (3-3-1); La Reina (0-2); Dos Pueblos (3-3); Culver City (0-2).